Make sure as you prepare for your New Year’s celebration that you have plenty of seltzer bottles on hand, along with some canapes – or is that can of peas? – and, of course, lots and lots of pies We suggest pumpkin or berry for dessert and to save the cream pies for the throwing! Nyuk! Nyuk! Nyuk! We look forward to seeing you all in 2016 so party wisely as you ring out the old and ring in the new. We hope the New Year brings you and yours health and happiness. We have to go now. Lots of pies and pastries to get ready. Get the tux ready. Shake up the seltzer bottles. Mix the music. Check the guest list. Check. Check, Check! Especially the gals…Alma Matter, Dolly Devore, Gail Tempest, Helen Blazes, Lady Godiva, Lorna Doone, Miss Bopper, Senorita Rita and all the rest of the lovely ladies. Since its formal we need to check the RSVPs from Miss Gottrocks, Mr. & Mrs. Manning, Mrs. Bixby, Mrs. Castor, Mrs. Burlap, Sheri and the rest of the Rumsfords, and Muriel and Arthur van Twitchett. Dewey, Cheatem & Howe can’t make it. Ziller, Zeller & Zoller can, as well as Dr. Howard, Dr. Fine & Dr. Howard. Make sure the menu is set. Plenty of bologna & whipped cream. Pate D’Fagua. Some Southern Comforter. All the normal stuff! Practice a bit so we can trip the light fantastic. Maybe some of you prefer cut a rug…If you’re too young to understand this ask someone older. Or Google it. Have to make a stop at Black Louie’s Pirate Den to stock up the bar…The Breath O’Heather Vat 106 Plus, Giggle Water, Old Panther and some Shingled Roof. You know, all the good stuff! 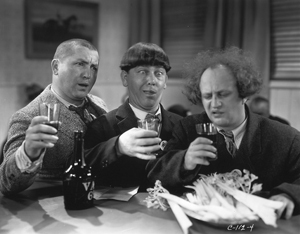 Keep the party going and watch your favorite Three Stooges shorts today. Yes…It is Soitenly! okay if you switch back a forth a bit to the football games. But not too much! Last but not least…No! Mixing Anacanapon + cedasscram + eenots with half a pint of edctowhozis will not cure a hangover! With that said, enjoy yourself and we’ll see you next year! Thanksgiving tradition tells us this holiday started in 1621 with the Pilgrims at the Plymouth Colony. The celebration was to commemorate the harvest after a harsh winter with Governor William Bradford proclaiming a day of Thanksgiving. The colonists celebrated with a traditional English harvest feast and invited the local Wampanoag Indians to join the feast. While this started the tradition, the Plymouth Colony Pilgrims actually did not repeat the celebration annually in the ensuing years. Similar celebrations did occur throughout the colonies, which were all still based on the traditional English fall harvest celebration. The 13 colonies first celebrated Thanksgiving on the same day in 1777 during the War for Independence. President George Washington first declared Thanksgiving a holiday in 1789. Various states celebrated the holiday but Thanksgiving became a national holiday when President Lincoln gave his Thanksgiving Proclamation in 1863 declaring the last Thursday in November a day of thanksgiving. President Franklin Roosevelt moved the day to the third Thursday in 1939. The Thanksgiving holiday was then set again as the fourth Thursday in November by Congressional action; making Thanksgiving somewhat unique since it is celebrated on a particular day, not a particular date. While we always see renderings of the original Pilgrims celebrating Thanksgiving dressed in all black and white with shiny buckles on their hats and shoes, their attire was probably, for the men, white or beige or brown and for the women red or earthy green, brown, blue or violet. Black and white were traditionally worn only on Sunday and at formal occasions. As to the shiny buckles: Very doubtful since brass buckles did not come onto fashion until much later in the 17th century. We also wonder what would have happened if the Pilgrims had sailed the Mayflower to their original destination on the Hudson River in New York? The first Thanksgiving in 1621 probably had a somewhat different menu then we have today. While no definitive ‘menu’ exists from the Thanksgiving celebration in 1621, historians have been able to compile a list of foods that may have been served and a list of what was not on the menu. We’ve got both lists here plus a few fun facts about turkeys. The first Thanksgiving feast was somewhat different to the fare that we traditionally serve our friends and family as we gather together to give thanks, watch the Macy’s Parade from New York while the turkey is cooking and then switch channels to catch all of the football games played on the fourth Thursday in November. Whew! Seafood served would be Cod, Eel, Clams and Lobster. Wild Fowl was abundant: Wild Turkey, Goose, Duck, Crane, Swan, Partridge and Eagle. Meat served would be Venison and Veal. Grain was limited to Wheat Flour and Indian Corn. Vegetables were varied: Pumpkin, Peas, Beans, Onions, Lettuce, Radishes and Carrots. Fruit was probably limited to Plums and Grapes. Nuts were Walnuts, Chestnuts and Acorns. Herbs & Seasonings were varied and different than what we would think of today: Olive Oil, Liverwort, Leeks, Dried Currants and Parsnips. Ham, which is now a staple of the meal in many homes, was not served. Although the Pilgrims brought pigs with them from England there is no evidence they had butchered any by the time of this first celebration. Potatoes & Sweet Potatoes were not common at that time. Corn on the Cob was not available as corn was kept dried out at this time of year. Cranberry Sauce would have been almost impossible to serve as while the colonists did have cranberries, they had no sugar. Pumpkin Pie was not a known recipe at that time although the Pilgrims did have a recipe for stewed pumpkin. Milk was absent as the colonists did not bring cows on the Mayflower. So we can see that what we look upon as the traditional Thanksgiving meal evolved over time and what we feast on today is quite different than the meal served at the first Thanksgiving. The turkey is actually a type of pheasant, just somewhat larger! The turkey is the only poultry breed native to the Western Hemisphere. A turkey has great hearing, sees in color and has a wide field of vision. Turkeys have an excellent sense of taste but a poor taste of smell, which may be a good thing! Wild turkeys can fly short distances and attain speeds of up to 55 miles per hour. Turkeys are susceptible to heart attack, maybe because they know that about 45 million will be cooked at Thanksgiving! The Three Stooges Visit Times Square! A Three Pattern with a Twist! Curly: And what’s more important, what’s your phone number! Press, Press, Pull is at the very far edge of a three pattern, as is Yes!, Yes!Yes!, No! which The Boys used several times in their shorts and movies. 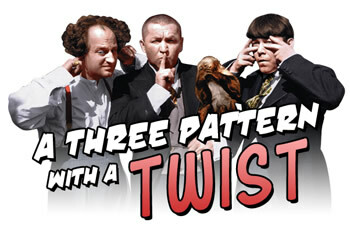 Our ‘Three Pattern With A Twist’ is just a hook to get you here so we can talk about questions! Like…Do we get questions? Soitenly! So now we’ll give you the answer to three questions. See a pattern here? Nyuk, Nyuk, Nyuk! Question (Q): Which short did Curly say ‘Oh Mammy Eggs and Hammy’? Answer (A): This is from the short ‘All The World’s A Stooge’. This short, released in May 1941, saw Larry, Moe and Curly wreck havoc in the dentist’s office and at the home of Mr. & Mrs. Bullion, who wanted to adopt them as refugee children. That’s where Curly did his famous Jolson impression. Q: What is the name of The Three Stooge theme song? A: Actually, there are two theme songs: Listen to the Mockingbird and Three Blind Mice. Most fans are familiar with the Three Blind Mice theme as it is used extensively in the opening and closing credits of the shorts, albeit with a jazzy arrangement. Q: Which short has the characters ‘Dewey, Cheatem & Howe’? A: While long a part of Stooge lore, these attorneys at law are truly fictitious, at least in the world of The Three Stooges and their films. The famous poster with Larry, Moe and Curley as Dewey, Cheatem & Howe was created only as a publicity item as The Boys never portrayed these characters. Also, there is no office door in any short with the Dewey, Cheatem and Howe moniker. The closest reference was the character I. Cheatham in the 1945 short ‘Three Pests In A Mess’. So now you have some answers to go along with some questions, which go together like, well…Eggs and Hammy! Oh Mammy! Picking up where Hoofs and Goofs left off, The Stooges’ apartment is a little crowded. They are doing their best to raise the baby colt and search for sister Birdie’s mate, a circus horse named Schnapps. The Stooges read in the newspaper that Schnapps has been injured, and may have to be put down. Knowing this would crush their sister, they set out to the circus to save him. At the circus, The Stooges split up. 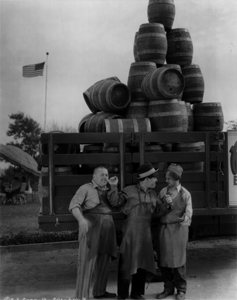 Moe and Larry distract the man (Emil Sitka) sent to destroy Schnapps by using a horse costume. Joe finds Schnapps and is able to reunite the two horses. Horsing Around features Moe and Larry’s more “gentlemanly” haircuts, first suggested by Joe Besser. However, these had to be used sparingly, as most of the shorts with Besser were remakes of earlier films, and new footage had to match with old. The same cabin is used for Guns a Poppin! In Punch Drunks, Moe is a struggling boxing manager having lunch with several associates who are angry at him for their low payment and threatening to quit on him. He notices that their shy waiter (Curly) goes into a violent fugue whenever he hears the song “Pop Goes the Weasel,” which is the case when he knocks out three associates and later his boss. Moe also takes notice of a fiddler (Larry) who happens to be playing the potent tune at the restaurant and quickly recruits the two unsuspecting cohorts and preps them for the boxing world. With Larry playing “Pop Goes the Weasel” at every boxing match, Curly becomes the number-one contender for the heavyweight championship. All goes well until the night of the highly anticipated World Championship match with Killer Kilduff (Al Hill). Only a few moments into the first round, Kilduff plants a left hook at Curly, sending him into the crowd, landing on Larry and crushing his violin. Frantic, Larry scurries the streets, looking for anything that is playing “Pop Goes the Weasel,” while Curly is being battered by the boxer. Larry manages to come across a politician’s campaign truck blaring the tune from its speakers and “race-drives” it to the arena, crashing through a side wall. Curly is just about ready to throw in the towel until he hears “Pop Goes the Weasel.” The wobbly boxer comes to his feet with renewed energy, and knocks out Kilduff in a matter of seconds, winning the fight. The song continues, however, and as they celebrate in the ring, Curly knocks out Larry and Moe and begins to advance on the camera as the short ends. 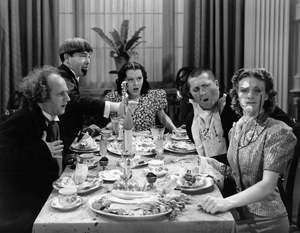 Emil Sitka, whose numerous appearances with the Three Stooges earned him the nickname “the Fourth Stooge,” was born in Johnstown, Pennsylvania on December 22, 1914. He was the oldest of five children, born of Hungarian immigrant parents. His father, Emil Sitka, a coal miner, died of black lung disease when Sitka was 12 years old, and his mother, Helena Matula Sitka, was hospitalized, unable to take care of the children. His siblings were placed in foster homes, but Sitka went to live in a church in Pittsburgh, Pennsylvania with a Catholic priest for the next few years. At this time, he became an altar boy and made plans to enter the priesthood, and had his first acting opportunity in the church’s annual Passion Play. At the age of 16, he and one of his brothers traveled across the U.S.A., riding the rails hobo-style, looking for work. After a year, they returned to Pittsburgh, where Sitka found a job working in a factory. He stayed there until the great St. Patrick’s Day Pittsburgh Flood of 1936, after which he departed to pursue his dream of acting in Hollywood, California. 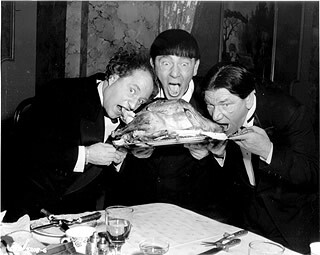 Sitka’s first Three Stooges’ film was Half-Wits Holiday. It was a reworking of their earlier Hoi Polloi. Both films were adaptations of George Bernard Shaw’s play Pygmalion (1913). 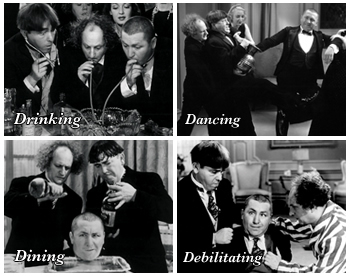 The Three Stooges’ films dealt with the idea that two professors bet on the outcome of turning the Three Stooges into gentlemen—with predictable results. Sitka played Sappington, the upper-crust butler, who was an excellent foil for the Three Stooges—and the target of several pies as well. Sitka’s most famous scene was when he approached a woman with a cocktail and stated, “Your drink madam,” and was plastered with a pie. Without changing expression, he says, “Pardon me madam” and walks off. However, during the filming on May 6, 1946, Jerome “Curly” Howard suffered a devastating stroke, another after a series just before Beer Barrel Polecats was filmed. Curly died 6 years later. 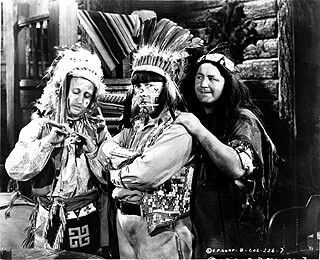 Despite this bittersweet beginning, Sitka went on to appear in dozens of Three Stooges short films, as well as most of their feature films and the live-action segments for The New Three Stooges 1965 cartoon series. He worked in both short films and feature films with others as well, including Lucille Ball, Milton Berle, Red Skelton, Tony Curtis, Alan Hale, Walter Brennan, Dan Blocker, Joey Bishop, Bob Denver, and many others. 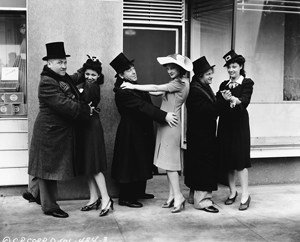 However, Sitka is best remembered for his association with the Three Stooges, and with one line in particular which he repeated several times: “Hold hands, you lovebirds!” from Brideless Groom. 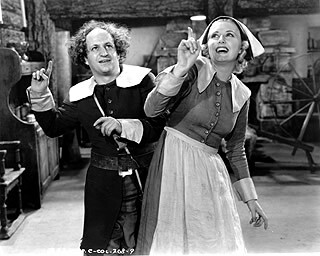 In January 1970, Larry Fine suffered a stroke during the filming of Kook’s Tour. Plans were in the works for Sitka to replace him as the Middle Stooge in late 1970 and again in ’75, but nothing other than a few promotional pictures were ever made. Sitka was to play Larry’s brother, Harry. 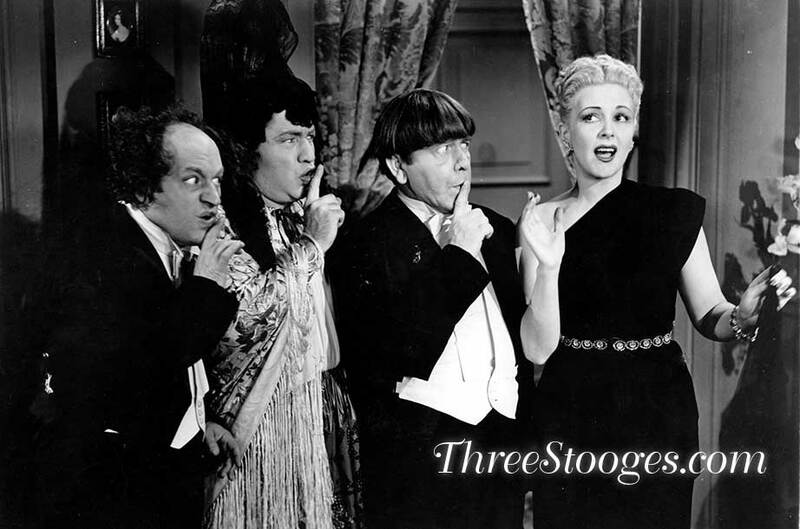 He later described him as being “conscientious to the point of ridiculousness.” Two feature film offers for the Stooges had been considered, but this proposed version of the group would never transpire, due to Moe falling ill and dying shortly after its conception. One of the film offers was Blazing Stewardesses, which would go on to feature the surviving members of the Ritz Brothers. In the 1947 Three Stooges short Brideless Groom, Shemp Howard must be married before 6:00 p.m. in order to inherit $500,000.00. After striking out, Shemp finally finds a girl willing to marry him, and they rush off to a justice of the peace (Sitka). As he starts the ceremony, initially telling the couple to “hold hands, you lovebirds”, the other girls that turned down Shemp’s proposal burst in, having heard of the inheritance. A free-for-all then ensues, with poor Sitka being struck again and again, attempting to start the ceremony, each time more disheveled and his “hold hands, you lovebirds” a bit weaker. 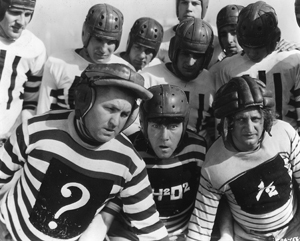 Because of the widespread distribution of this short (it is one of four Three Stooges shorts that slipped into public domain and was broadcast countless times on local television stations as a result—one station in Richmond, Virginia ran it almost every Sunday afternoon for years in the 1980s), this scene is the one that Sitka has become best known for. Notably, a clip of this short is featured in Pulp Fiction, for which Sitka’s name even appears in the credits as “Hold Hands You Lovebirds.” He continued his association with the Stooges for the next 25 years, and in 1975, was offered the chance to finally join the trio. A native of Nogales, Arizona, Christine McIntyre was one of five children. A classically trained singer, McIntyre received a Bachelor of Music degree at Chicago Musical College in 1933. It was here that she developed her operatic soprano voice, which would be put to good use in several Three Stooges films in the 1940s. McIntyre began singing in feature films at RKO Pictures and made her film debut in 1937’s Swing Fever. She then appeared in a series of B-westerns featuring the likes of Ray Corrigan and Buck Jones. She appeared with dark hair in these early roles, and also appeared occasionally in “mainstream” feature films (like 1939’s Blondie Takes a Vacation). She sang songs such as “The Blue Danube” and “Voices of Spring” in a Vienna-themed short Soundies musical film, and her performance was singled out as the best of the inaugural series. Her singing in this soundie may have given the Three Stooges the idea of using “Voices of Spring” in their short film Micro-Phonies. It was in 1944 that Columbia Pictures producer Hugh McCollum signed Christine McIntyre to a decade-long contract. During her time at Columbia, she appeared in many short subjects starring Shemp Howard, Andy Clyde, Joe Besser, Bert Wheeler, and Hugh Herbert. The Herbert comedy Wife Decoy is actually a showcase for McIntyre, who is the principal character. In this film, she appears as a brunette who dyes her hair blonde. From then on in her screen appearances, she remained a blonde. In all of her Columbia comedies, she demonstrated a capable range, playing charming heroines, scheming villains, and flighty socialites equally well. McIntyre’s association with the Three Stooges would become her most memorable. Her debut appearance with the team was in Idle Roomers, followed by a solo Shemp Howard short, Open Season For Saps. McIntyre’s singing voice was featured prominently in 1945’s Micro-Phonies, as she sang both “Voices of Spring” and “Lucia Sextet.” She would again sing “Lucia Sextet” three years later in Squareheads of the Round Table and it’s 1954 remake, Knutzy Knights. McIntyre also won a feature-film contract with Monogram Pictures. After playing a newspaper publisher in News Hounds, a comedy with The Bowery Boys, she usually played opposite Monogram’s cowboy stars in low-budget Westerns. Her attractive features belied that she was close to 40 years of age at the time, much more mature than the conventional ingenue. McIntyre married radio personality J. Donald Wilson in 1953. When her contract at Columbia expired in 1954, retired from show business, eventually developing a career in real estate. Columbia continued to use old footage of McIntyre through 1958, which is why she received billing in films made after her retirement. Her performance as Miss Hopkins in Brideless Groom featured a knockabout scene in which she beats voice instructor Shemp Howard into submission. In Hot Scots, she played Lorna Doone. The film gifted us with the indelible pun uttered by Shemp, “Hi, Lorna, how ya’ doin’? McIntyre turned up the slapstick with her physical humor in Studio Stoops. As Dolly Devore, she dangles Shemp out of a window as she and Moe struggle with a rope. She beats up the bad guys by slamming their hands in a door and smashing flower pots over their heads. Scheming Schemers offers the last footage of the skillful comedienne. 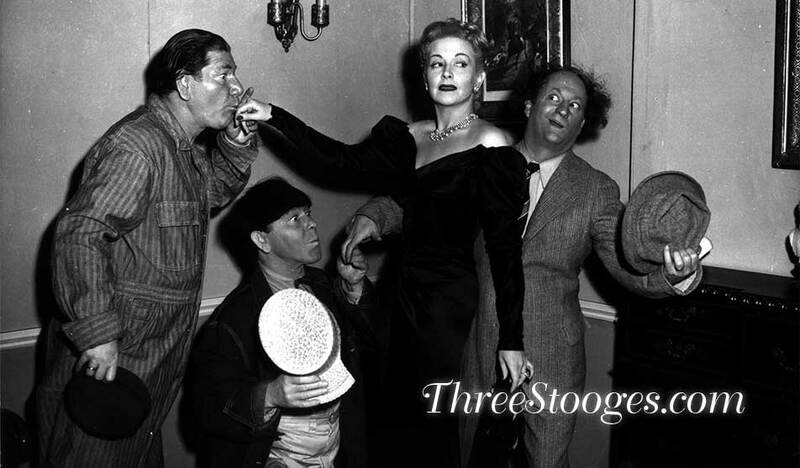 Christine McIntyre is credited in 36 Three Stooges film shorts, 8 of them use stock footage. 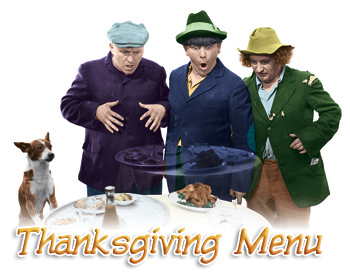 The Three Stooges Archive – ©C3 Entertainment, Inc. The Three Stooges is a registered trademark of C3 Entertainment, Inc.
Born September 17, 1900, Jules White began working in motion pictures in the 1910s, as a child actor, for Pathé Studios. He appears in a small role as a Confederate soldier in the landmark silent feature The Birth of a Nation (1915). By the 1920s his brother Jack White had become a successful comedy producer at Educational Pictures, and Jules worked for him as a film editor. Jules became a director in 1926, specializing in comedies. Jules White produced and/or directed more than 130 of the nearly 200 Three Stooges’ comedies in addition to directing such classic slapstick comedians as Buster Keaton, Harry Langdon, Charlie Chase and Chester Conklin. 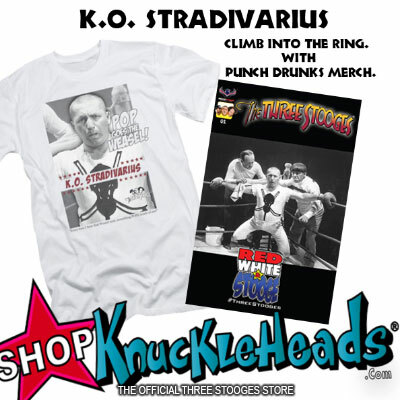 Almost 40% of White’s output stars The Three Stooges. His work earned him four Academy Award nominations. White, who took over the short subjects department at Columbia Pictures in 1934, died at age 84. 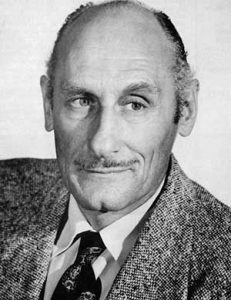 He had retired in 1958, the same year that the studio closed his department after the short subject, which was often sandwiched between two major film features, lost its appeal. White came to Columbia from Paramount, where he was an assistant director, and Metro-Goldwyn-Mayer, where he helped to create “The Barkies,” a series of one-reelers that featured talking dogs. White also produced, directed or wrote about 500 other shorts for Columbia* including solo shorts for Shemp, Joe Besser, and Joe DeRita.